Marc Trujillo evokes an urban landscape that at first seems devoid of humanity, rendered with a distant, realistic eye. 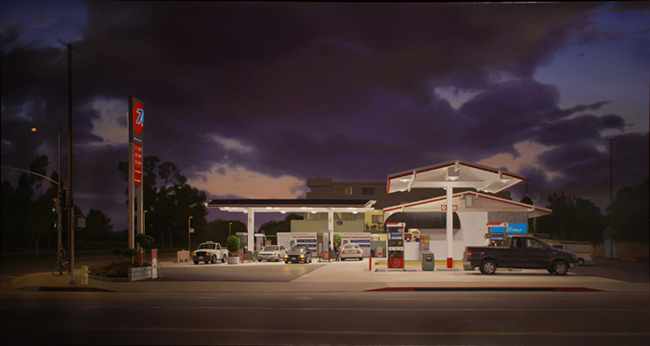 Yet he lights his gas station not with the coldness of mercury vapor lights, familiar to anyone pumping gas late at night, but rather with the moody, warm illumination of a painter’s brush, all golds and purples. Like Edward Hopper, a realist painter of eerily quiet urban landscapes, Trujillo remains deeply interested in the fictive craft of painting, the preoccupations of people as they relate to their community, and the role of storytelling even in a mundane moment. Both artists invent willfully within their paintings–the lighting, the surfaces, and the shadows all play a role in creating a mood in which to set a contemporary play. For Trujillo, places such as gas stations and shopping malls are purgatories, abodes for transitory souls consumed with destinations, distractions, and duties, rather than their present surroundings. In this way, Trujillo paints from what he calls “the middle ground of existence,” gas stations rather than postcard destinations like the Grand Canyon. He does not create sentimental pictures. Scenes of extreme drama play into sentimentality, a sense that the artist or writer has provoked emotions without having actually earned that moment, through a quiet characterization, steadily unfolding, or the evocation of a painterly mood. By settling his gaze on prosaic places that other people bustle past, Trujillo asks us to reconsider our notions of drama and narrative. Trujillo cites Peter Breughel’s “The Fall of Icarus,” (c.1558) as a surprising work, which embodies his contemporary storytelling philosophy. Breughel, from the Netherlands, paints gently humorous scenes of peasant life gone awry with sin and gluttony in the Calvinist dogma of his time: humanity is deeply flawed and prone to mischief. In the Icarus painting, however, the scene seems idyllic: in the foreground, a man plows his field with a yoked horse, and beyond him, a shepherd attends to his sheep. In the sea beyond them, grand ships sail, buffeted by the wind, possibly to do business with a gleaming city on a distant shore. Yet after peering more closely into the painting, one sees a tiny pair of legs in the sea, flailing amidst a splash, an unceremonious corona of water. Icarus, the mythological Greek character who had built wings of wax only to fly too close to the sun, crashing to the world below, now plays but a small role in the painting. Breughel suggests that even in the moments of greatest tragedy or peril, life goes on. Trujillo sees this painting as a testimonial to a different kind of narrative, where the high moments of human drama invert with the quiet moments we too often rush past or subsume to other thoughts. Trujillo refocuses the viewer on the material of daily life. He asks us to pause within the transitory landscapes we construct for commerce, or merely to wile away our time, and see them as eerily new. How can we feel harmonious in such spaces, which often become the setting of our daily life and our community? Marc Trujillo is an urban landscape painter who depicts the big box retail stores, self-service gas stations, and fast-food chains that make up a large portion of the urban environment. Free of political or moral overtones, these works function both as modern North American genre scenes (much like the 17th–century Dutch genre scenes of marketplaces, courtyards, and flower stalls) and as painterly meditations on color, light, and form. According to art historian Andrew Forge, in Trujillo’s paintings “time is rescued, transformed from loss to duration [and] absence is given presence.”1 All of the places Trujillo depicts contribute to the increasingly fast-paced world in which we live, where attention spans have diminished beyond the point of no return. Trujillo, however, subverts this freneticism by capturing it in an objective, but highly aesthetic manner, that allows the viewer to experience an alternative reality present in such quotidian locales. Although based on direct observation, Trujillo’s paintings are completely synthetic and rigorously structured. While the places depicted are nominally in the Los Angeles area, they are in actuality generic environments that are familiar to most Americans. From these boxy, cookie-cutter industrial building designs, Trujillo builds compositions based on complicated arrays of angled planes and radial lines that recede into deep space.2 The depiction of light, both artificial and natural, is handled with extreme care as is the overall color balance within each painting. Marc Trujillo exhibits nationally on both coasts and is the recipient of numerous awards and fellowships, including a 2008 Guggenheim Fellowship, the 2008 Rosenthal Family Foundation Award in Painting from the American Academy of Arts and Letters, and a 2001 Louis Comfort Tiffany Foundation Award. The artist grew up in Albuquerque, NM, and currently resides in Los Angeles. This entry was posted on Tuesday, September 1st, 2009 at 12:09 pm	and is filed under Art. You can follow any responses to this entry through the RSS 2.0 feed.